I have a very special, kidney shaped flower border in my front yard. Some years it has been better than this year. The unusually warm winter, and lack of snowfall (when it did get below zero) killed or severely setback a couple of my key perennials in the garden. Possibly the lack of moisture this spring with no snow to melt had something to do with it too. The Gardenview Scarlett Monarda's red, long lasting, spiky blossoms were real eye catchers. A small remnant of the plant remains, and I'm hoping it will fill in again. 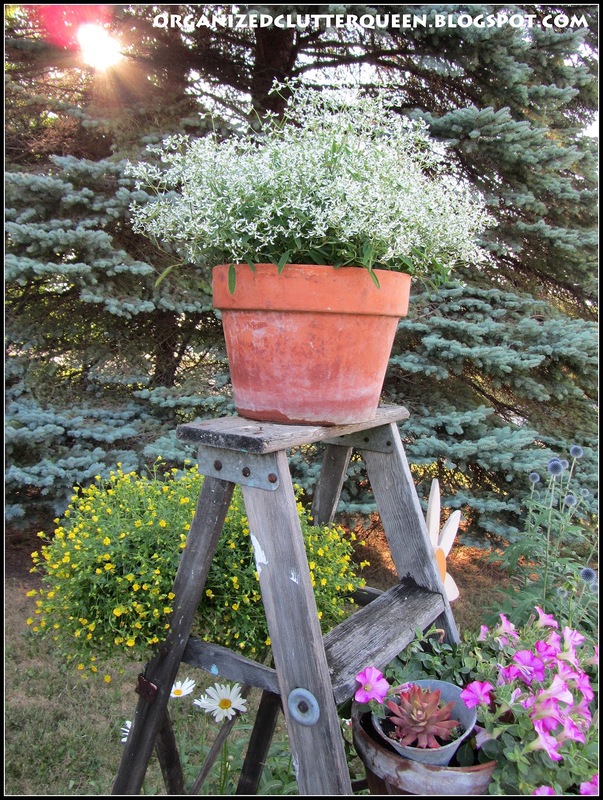 Also my tall Baby's Breath plant is a ghost of it's former self. Liatris, very few blossoms. 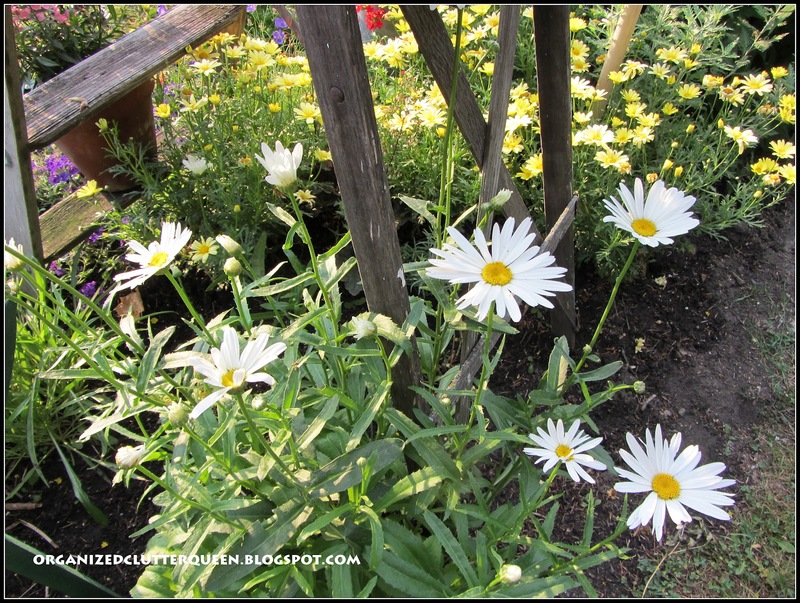 Coneflowers, Maltese Cross and Shasta daisies are all blooming on shorter stems. In 2011. Fabulous red monarda and maltese cross to the right of the step ladder. In 2010. It also seemed the flowers were blooming in unison. This year many bloomed early on short stems some bloomed at their usual times. To compensate for some trouble with the perennials, I have loaded up on more annuals this year. Current year 2012. Pretty, but not as lush as previous years. 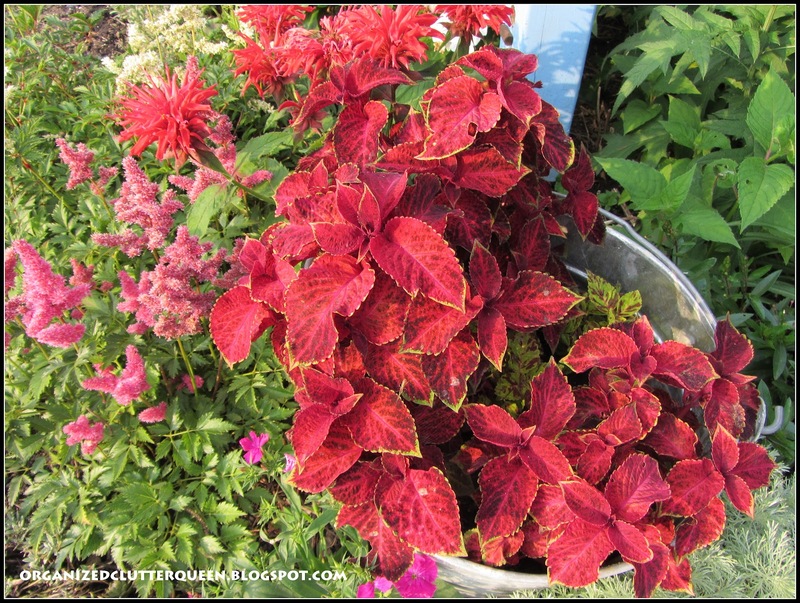 The pitiful (10" instead of 3 feet high) monarda is behind the pail of coleus. Astilbes in red and white at the front of the border. 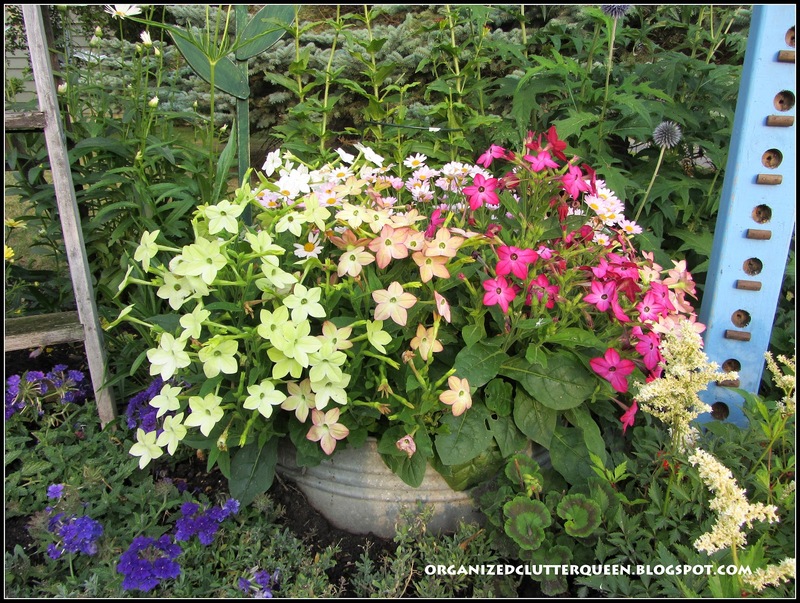 Nicotiana and pink marguerite daisies in the laundry tub sunk in the border. This photo was taken at sunrise and the glow is so pretty! 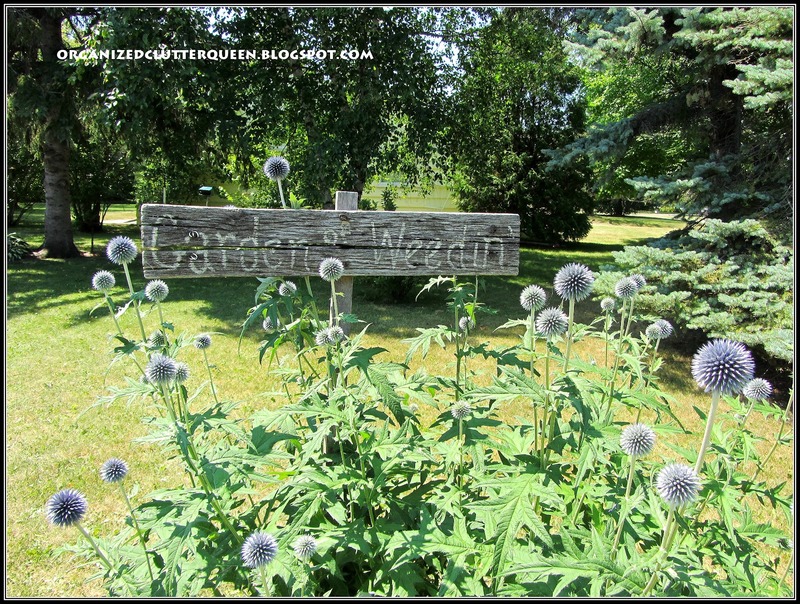 This sign has been in my border for so long that I sometimes refer to the garden as the "Garden of Weedin'". Globe thistles not quite in bloom. We must have got an inch of rain the day before yesterday so I hope the grass greens up. The Shastas growing next to the step ladder. The yellow asiatics blooming on shorter stems with less blossoms. 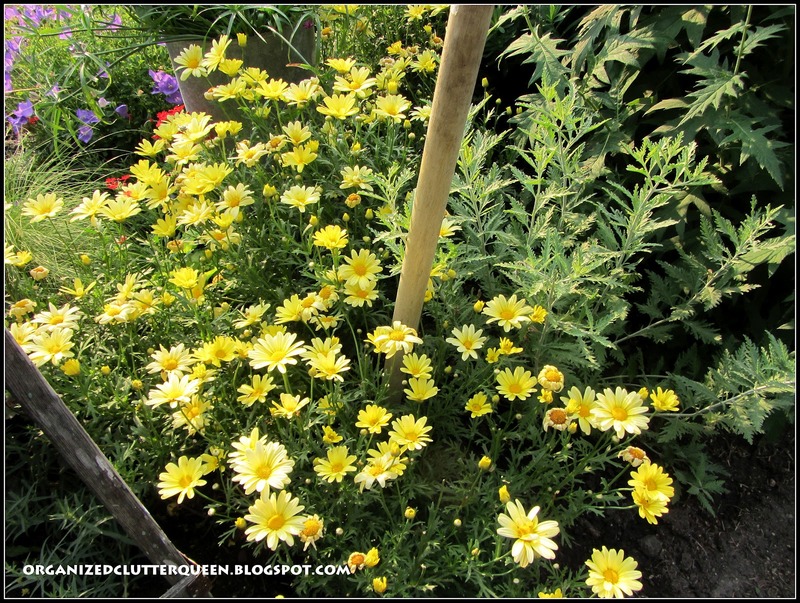 One of the best annuals to fill the border in a year like this is the Marguerite yellow daisy. Forever blooming. Filling in nicely. 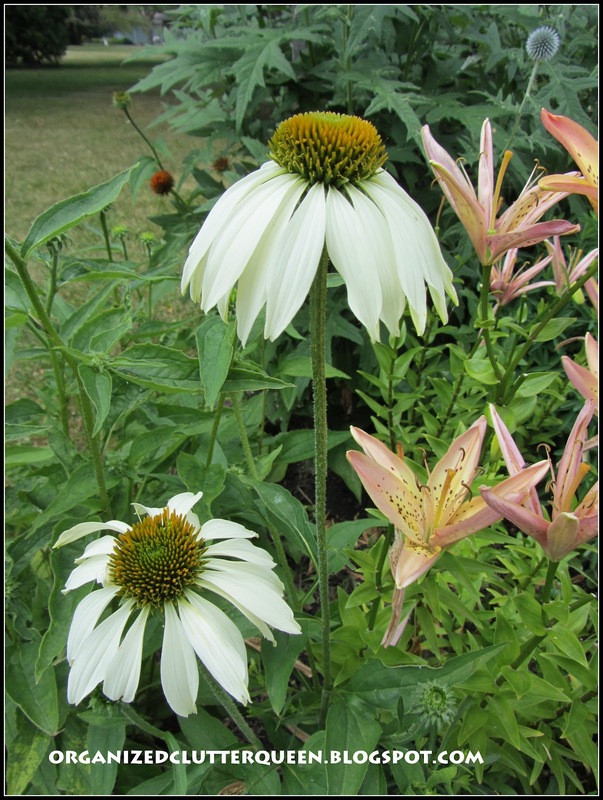 White coneflowers and the tail end bloom of some Asiatics. Front and side of the stepladder. My chicken feeder is tucked in there on the left. Baby Tut grass and two calibrachoas planted inside. Kind of a disappointment. Did not take off. Beautiful purple verbena in front. That's the front yard border 2012! Your garden is still beautiful! I love ths shot of the sun peeking through the pines. So pretty! Your garden is lovely. I love the ladder you have added for height. It's just beautiful. So, so beautiful! You have quite the green thumb. 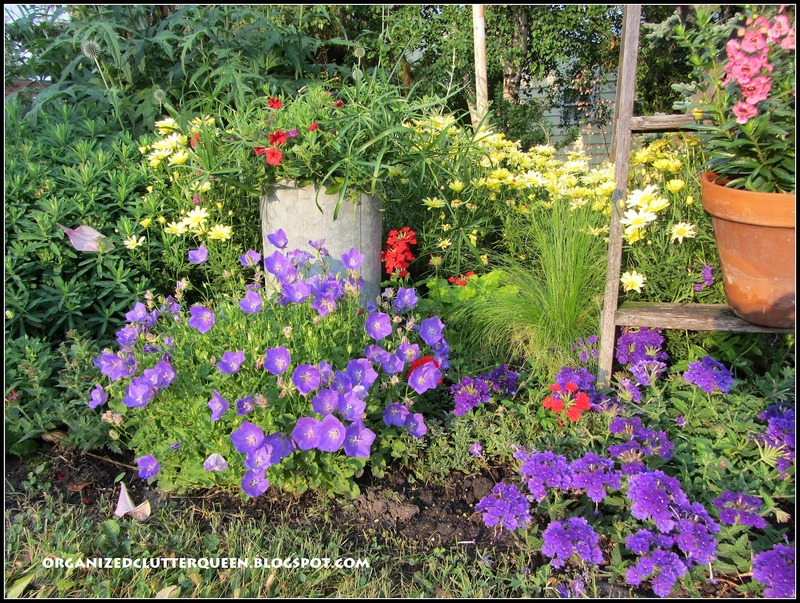 Your garden is beautiful! I know what you mean, right now I am really just trying to get everything alive. Yesterday was the first time we had rain, only 20 minutes, for over 21 days. I don't remember a heat/dry spell like this one. Even though you garden isn't as lush, it is just the same so pretty. So glad you shared your creative inspiration with Sunday's Best! Great Gardening! 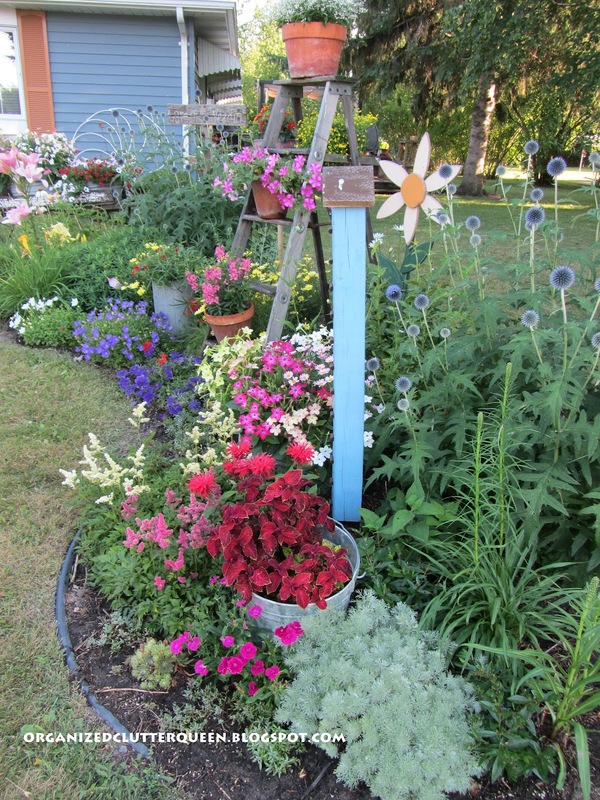 Lovin the Bee Balm and the Globe Thistle:) So many wonderful POPS of color is just beautiful! A gardener after my own heart:)! Your garden is beautiful no matter what the year~ It is something to be proud of. Love it. This garden is magnificant. It is so pretty and the flowers look so healthy and great color. Your garden looks great! I am having the same experience with my perennials. My purple coneflowers are so small and have hardly had any blooms. I had a white one but haven't seen any activity on it at all. I keep watering, but my dad says the plants like rain water much better than lake water, no chemicals. 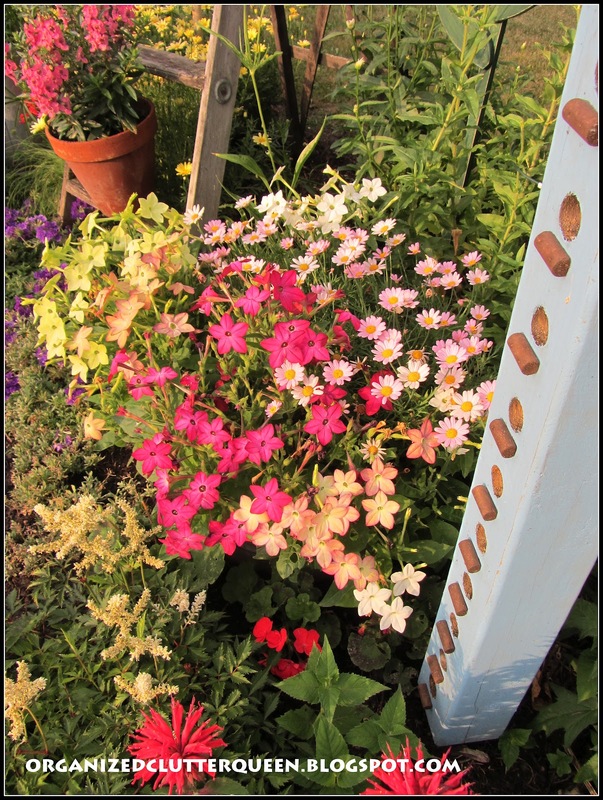 Thank goodness for annuals! Your garden is lovely! I can understand and appreciate the change from year to year. I would agree the weather has had a hand in this year's performance. You've adapted well. It looks lovely!!!!! Even though it's not as full as years past it is still beautiful! 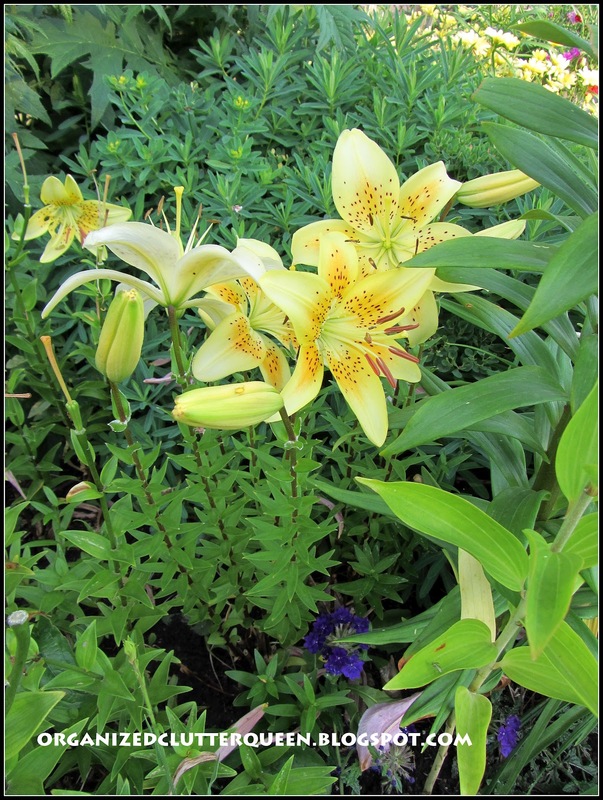 I love the globe thistle and your lilies! My gardens aren't performing as well as yours. Thanks so much for sharing at the party again this week! Your flower garden is absolutely beautiful! I love all the flowers - the photos are breathtaking! 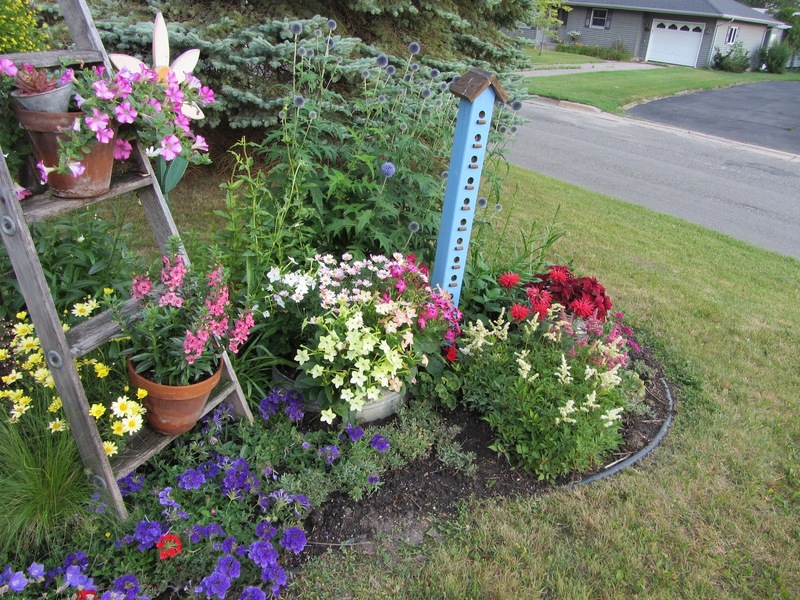 Carlene, Your front yard flower border is gorgeous! Great choices of flowers and colors. You really have it looking beautiful, and I like all your garden adornments. Hi Carlene! Oh, your front flower border is just gorgeous! I love your mixture of plants and everything looks like it thriving beautifully! I love it. 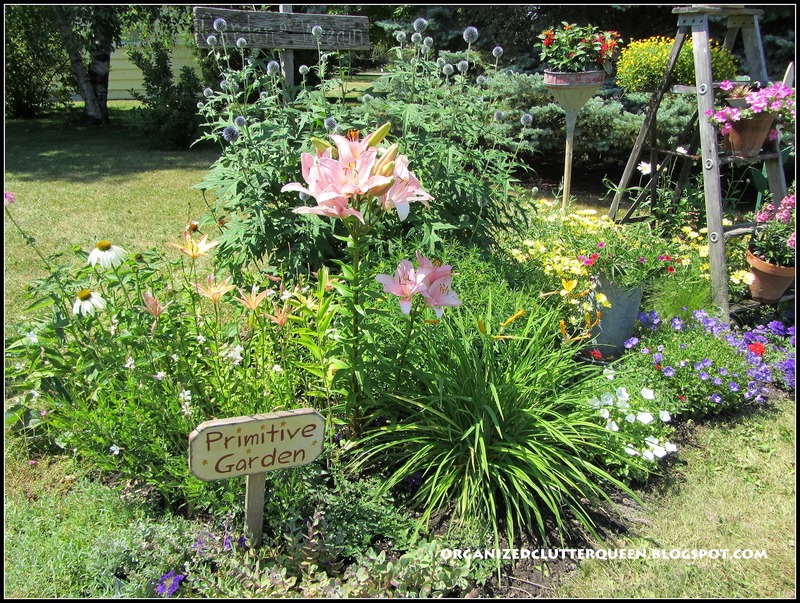 Carlene, your garden is lovely! It may not be as lush as in past years, but still it is amazing. Are you guys having a drought? We are. It's tough. I feel guilty watering the lawn. So I don't. 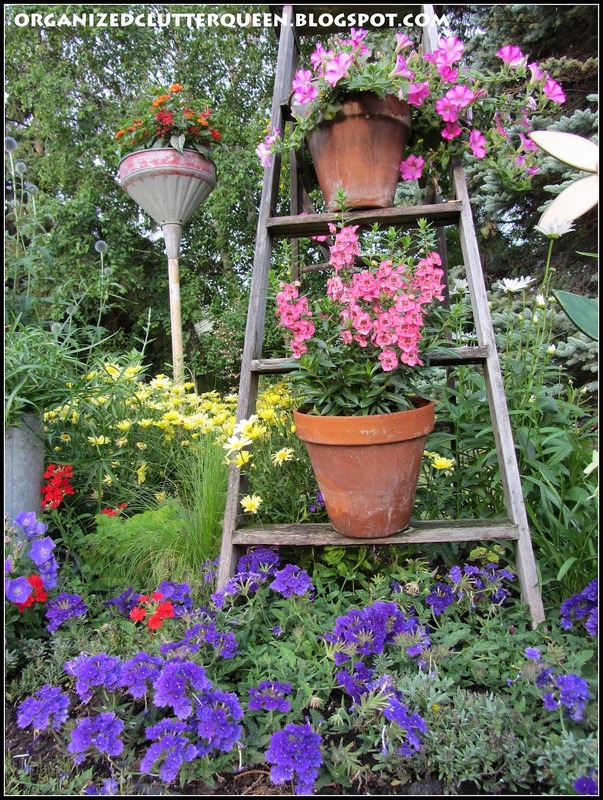 Hey - I LOVE your ladders as plant holders in your garden! What a fun sculptural element! Wow! You have gorgeous flowers! I guess everyone and every place has been affected by this seasons weather. Our yard is shot. Just watering around the edges and not even allowed to do that now. Maybe next year it will be better. Your gardens have been beautiful. Not too bad this year either. If you didn't show us the before, we wont know that it is not as nice! But i agree with your they are not in unison this year, and the heights didn't follow the orders now! But in general still organized! Your garden looks great. My flowers didn't do very well. I think it's because the ground didn't freeze here like it normally does. And now the heat has everything looking sick. I also love that really tall birdhouse condo. Thanks for sharing at the All Star Block Party. I don't care what you say about previous years, it looks fabulous to me. Lush and colorful and beautiful. On top of that, I just learned all sorts of flower names! (well, I'll forget them in no time, but you'll remind me again, I'm sure.) Just love the highs and lows and spill overs and colors. Your sign made me snicker out loud. Such a sweet place, Carlene! Oh my your garden is beautiful!! You have done an awesome job! 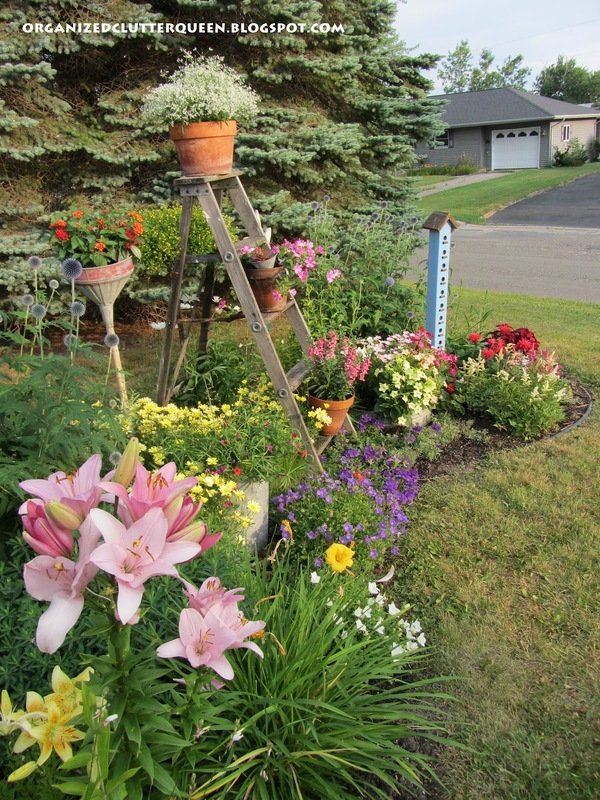 I think I need to get more annuals next year as I notice this time of year everything has kind of bloomed out also. Just beautiful! It still looks great this year! What a beautiful garden you have created!!! Your gardens are overflowing with beauty. You must have a greeen thumb. Spectacular! Just so pretty, how cute the sign is, Garden of Weedin!!! Such a wonderful variety of flowers! 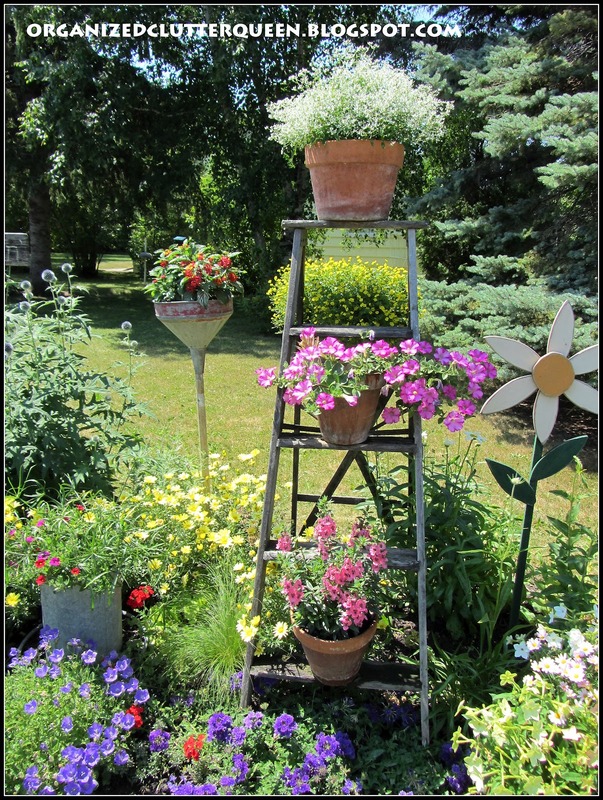 A labor of love to plan and care for the plants when Mother Nature doesn't do her share. It is lovely. 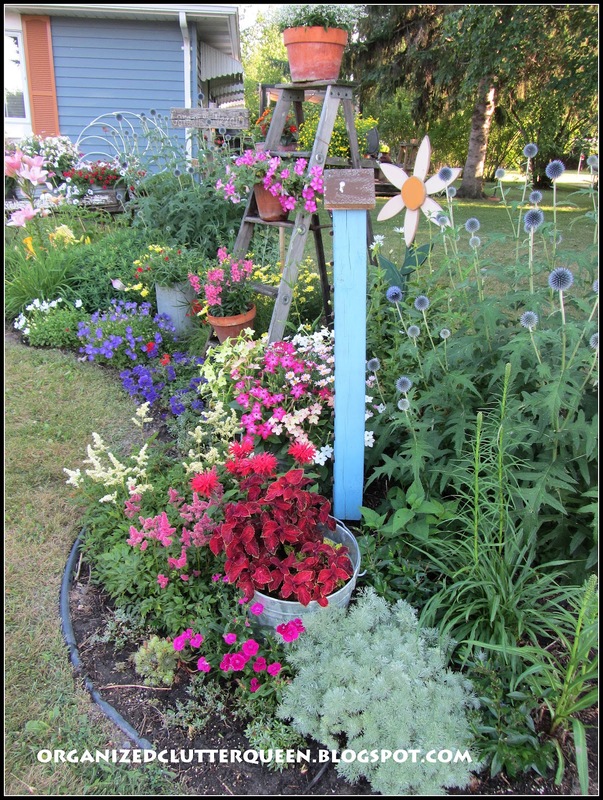 I enjoyed seeing your front flower bed with big sweeping curves and colourful, healthy flowers. My gardens are suffering from lack of rain but are still managing to look presentable. 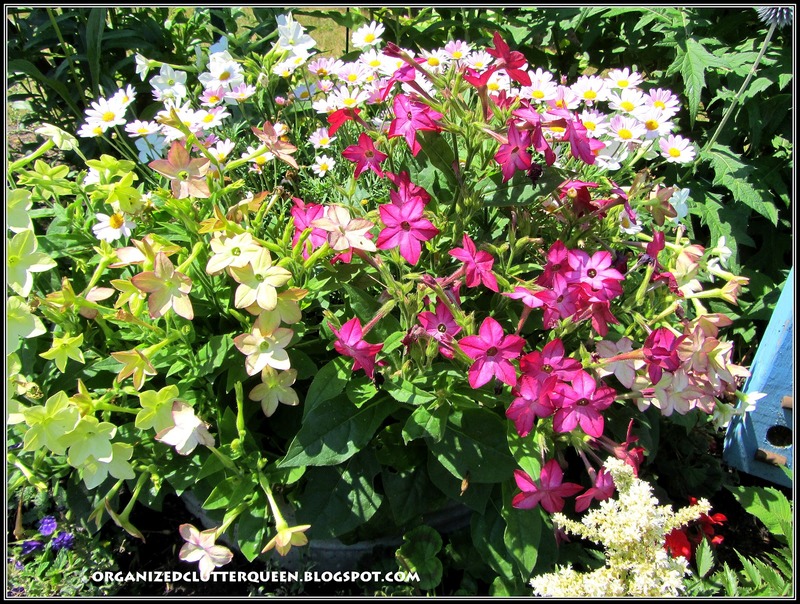 Annuals are seldom used in my beds but I like how you have used them to fill in areas. Your garden is divine. I'm a bit jealous! Beautiful gardens! I am working on mine like crazy and will be so thrilled when they are filled in like yours. I do see a difference from the previous years, it is still very pretty! You have some great combinations here. Oh so beautiful and love all the whimsy. Plants are so much fun to grow and look at. Come by and see my birds eye view of my garden/back yard.